Apartment buildings require a lot of indoor and outdoor signage to help tenants and their visitors. We can design, create, and install custom signs that will display a message to all of your tenants and visitors while improving the aesthetics of your complex. Every building needs an address number sign so the location can be found. For this exterior sign we cut out aluminum dimensional letters for the address numbers and we painted black. We then applied them to a piece of gold painted aluminum to match the exterior building wall. Aluminum is durable, yet lightweight and it is a great option for exterior signage. Dimensional letters look much nicer than the common cut vinyl most apartment buildings use. Attention to small details like this will make a big difference to the aesthetics of the complex. When a potential tenant is apartment hunting, there are a lot of other competitors. You want to make sure that you stand out from the competition by using signage that will impress people and make them want to live there. Poorly maintained signage can even turn people away from your business. It gives the impression that the management does not care about the aesthetics of the building which also suggests that living there will not be a good experience. We were also asked to create a new gate sign. 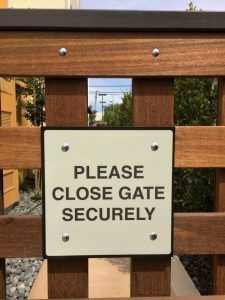 A gate sign is a great way to convey information to everyone that walks in. The letters were digitally printed onto white vinyl, laminated with clear vinyl and adhered to a sibond backer. The backer was then attached to a piece of wood that was attached directly to the gate. Another example of a gate sign are pool signs or no trespassing signs. Installing the sign where everyone walking in will see it makes the sign more effective. Everyone has seen the typical sign with the blue font on a white background. While the message is legible, it does not stand out from other public signage. We can help you design impressive signs that you and your tenants will be happy to have. 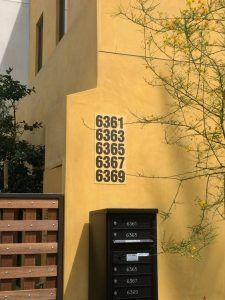 There are many other apartment signs we make which include but are not limited to mailbox tags, directory signs, suite number signs, floor signs, and many more. Feel free to E-mail us with any questions. If you are interested in having us assist you with your apartment signage, you can request a free quote here.